Baby showers are so fun, aren’t they? You ooh and aah over the cutest baby clothes in pastel shades, ogle over the new fangled baby gear and how much it has changed since your baby showers, and then play shower games that can get just a wee bit crazy when they involve guessing how many inches around the pregnant belly is. They also always have a mighty impressive spread of food. But have you ever attended a virtual baby shower? They include all of the cool parts of a baby shower without the measuring tape even making an appearance! 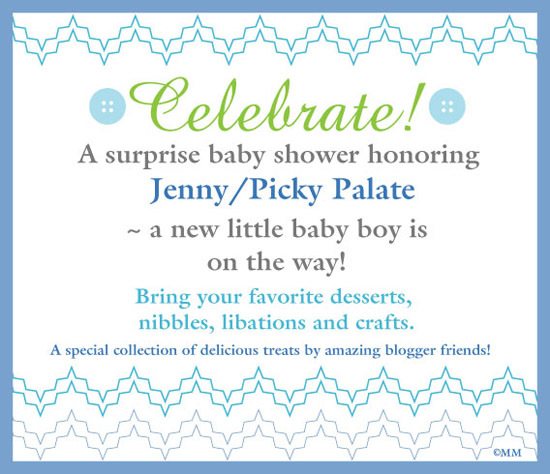 Today, I’m part of a group of friends hosting a fun baby shower for my friend, Jenny of Picky-Palate.com. I have a feeling you may have heard of Jenny and her fabulous blog. She is a genius at creating mouth-watering recipes and her first cookbook is available for pre-order now. I can’t wait to see what all her book has in store. I feel certain it will be fabulous, knowing Jenny! In addition to being a wonder at recipe development, she is as sweet as they come. Since Jenny is having her third little boy, I knew just what I wanted to bring to her shower. Not any ol’ thing would do. I made Blue Velvet Cake! From scratch! Cake is always a favorite part of any shower and I wanted it to have a surprise inside when you cut it. Unexpected, vibrant, and perfect for a little boy. 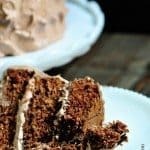 Blue Velvet Cake has all of the great taste of the more traditional Red Velvet Cake, but with such a fun twist that everyone will remember it. 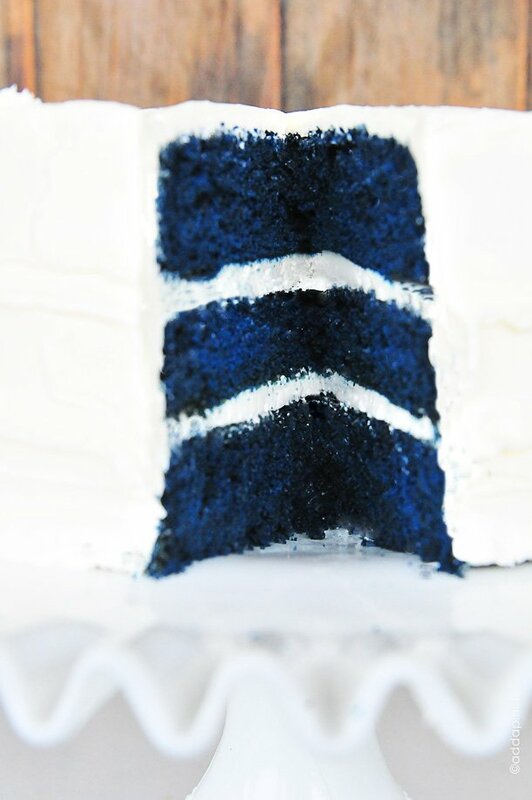 Blue Velvet Cake is perfect for a fun twist on the traditional red velvet cake with the same great taste. Grease and flour 3 8-inch round cake pans. Cream Crisco and sugar together until light and fluffy, about three minutes. Add eggs one at a time, completely incorporating after each addition. In a small bowl, make a paste of food coloring and cocoa and add to mixture. Stir together flour and salt in a separate medium bowl, set aside. Pour buttermilk and vanilla into a measuring cup, set aside. Alternately, add flour mixture and buttermilk mixture into Crisco/sugar mixture, beginning and ending with flour. Scrape down sides of mixing bowl to ensure all ingredients are well incorporated. Reduce speed of mixer and stir in baking soda, making sure incorporated into batter. Then, stir in the vinegar, taking care not to beat hard or over mix. Distribute cake batter evenly into the three cake pans. 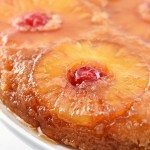 Bake for 25 minutes or until cakes have gently pulled away from the edges of the cake pans and a cake tester or toothpick inserted in the center of the cake comes out clean.. Cool cake thoroughly before frosting. Notes: I used Americolor Soft Gel Paste in Royal Blue and Violet. You may also want to try a natural-based food coloring. Now, I hope you’ll visit Jenny and wish her all the best with her upcoming bundle of joy! Please be sure to check out all of the other amazing things shared for Jenny’s Shower. From the looks of it, Jenny’s shower is going to be mighty sweet! Enjoy! Sure! What a beautiful idea for a wedding!!! When you say soda do you mean baking soda ? 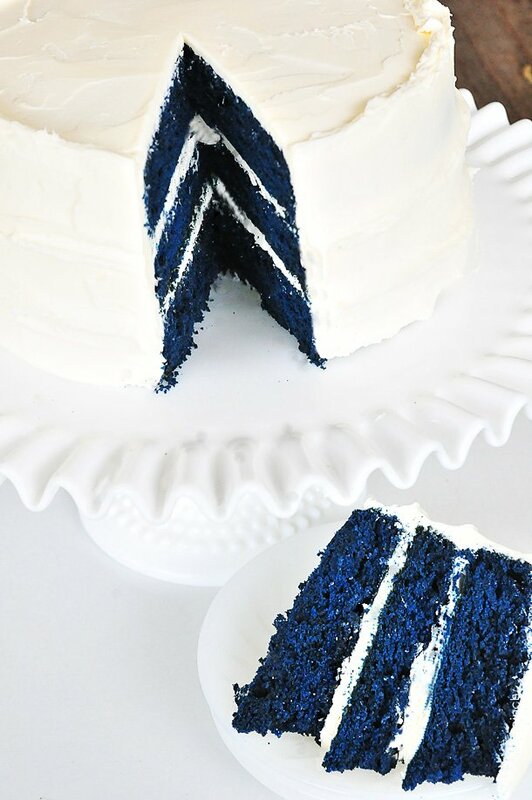 I came across your blue velvet cake recipe on Pinterest, I’m planning on using it for a friends upcoming wedding, theme being seahawks. But I had a couple questions I was hoping you could answer for me. -it says to use gel paste, what kind of food coloring do you use, americolor or wilton? -what kind of cocoa did you use? 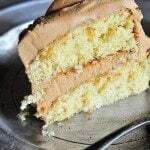 Im a hobby baker and I have tried several of your recipes. This one is not quite so good. I found the taste lacking that “velvet” also a bit dry. Hey! I just wanted to ask you whether I can use 1/2 cup of butter instead of Crisco. 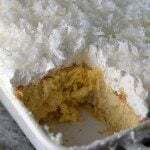 You can use butter instead of Crisco, but it will change the structure of the cake slightly. The cake will not be as moist, etc. If you don’t want to use Crisco, you could use coconut oil instead. Hi Robyn! I hope it’s not too late to post this question. 😀 I’ve been asked by a cousin to bake her wedding cupcakes and to turn red velvet ones to teal (her motif). I was quite successful making a blue velvet cake but not quite sure on how to mix the colors to create a teal velvet cupcake. Americolor and Chefmaster is available in my country so should I just use teal then add a dab of violet? Or just the teal? Hope you can make some suggestions. Thanks! Can I use Butter instead of Crisco? When you say soda do you mean baking soda? Also does this cake taste like dye? Yes baking soda. I would guess it tastes even better than the red version as the red food coloring is rather pungent. Does the cake taste like food coloring or is it rich? 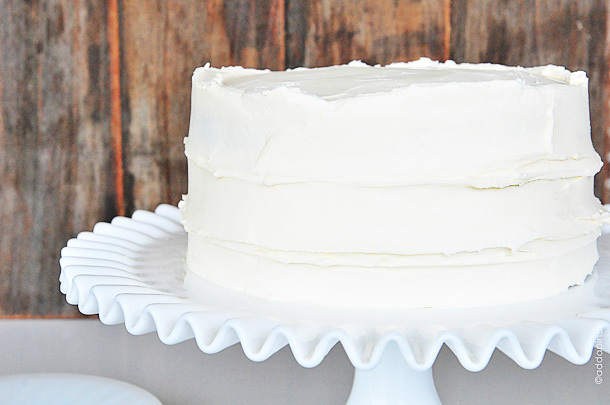 The blue velvet cake is the original recipe that I got from my Mother. It was probably in the 1950’s when she brought it home from her teaching job. My copy called for 2 teaspoons of cocoa which I immediately changed to 2 tablespoons so I am glad to see that this is the correct measurement. It also claimed to come from the Waldorf. May version add baking powder which I believe to be wrong. The buttermilk kills the baking powder. The leavening is provided b the reaction of the baking soda and vinegar. I had instruction to fold in the soda and vinegar and if your arm hurt then you knew you were doing it right. I have made Many of these and now I will make a blue one. I found they work well in an 7×11 inch pan if you want a sheet cake. Thank you for bring back happy memories. I got a last minute wedding reception cake for July 9th!!!! Bride wants a 2 tiered blue velvet. How do you think this cake would do stacked? Is it too soft/moist to hold up? It looks delish! I would love to know some insight on this recipe before committing to it. Please get back soon. Blessings!!!!! Hi, my cakes came out kind of flat. Not much depth to them. What did I do wrong? They were also a little hard around the sides. I baked the contents in 2 nine inch round pans for 25 minutes @ 350°. I adapt a lot of recipes to larger tins. If you put something in a larger tin the surface area is larger – and cakes cook from the outside in, so the edges are going to be crisper in the time that it takes the middle to cook.. If you change to larger pans, you need to decrease the oven temperature & cook for longer – proportionate to the size of the tin that you’re using. I know your comment was from a while ago, but I hope this helps in future! The blue velvet cupcakes turned out great ! Everyone loved them. However,I notice when I mix the cocoa and clothing to make paste and mix with the batter there are tiny lumps and when it’s bake the lumps are in the cupcakes.what do you suggest I do too get the lumps out? t tsp soda….baking soda right? Yes it is baking soda. Thanks! Are you using liquid or solid Crisco? And is it only 1/2 cup? Just wondering what was used for the frosting!?? 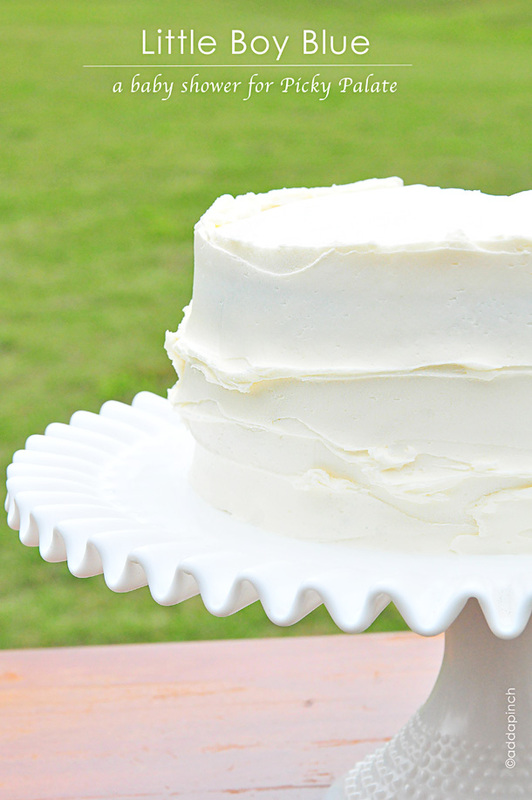 You can use Cream Cheese Frosting or Heritage Frosting. I hope you enjoy the cake! Thanks! Yes, it is baking soda. Hope you enjoy the cake! Thanks! Hi, also wondering if its vegetable “oil” or solid shortening crisco. It is solid Crisco shortening as you cream it with the sugar and eggs. I hope you enjoy the cake! Thanks! Do you know about how many cupcakes this recipe would make? 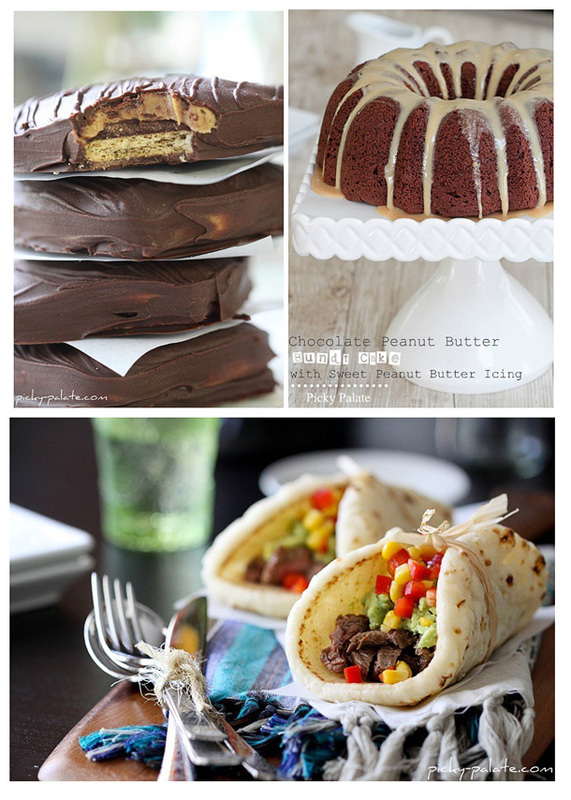 Wanting to bake them for a Graduation Party this next week. Thank you! You will bake at the same temperature, but the cupcakes won’t take as long, so check the cupcakes for doneness earlier than the time needed for this cake. I would recommend baking a test cupcake to get the correct time needed, then bake the remainder of the cupcakes. I too have the same doubt as the above baker raised. Please answer and cllear the doubt . I’m here in Australia and do not know what “Chrisco” is. Do you know what the substitute is here? I understand Chrisco is just the brand name but what is the product? Crisco is a vegetable shortening. I’m not certain what the substitute would be in Australia. I hope you enjoy the cake. Thanks so much! I used granulated sugar in this recipe. Enjoy! Thanks! When you say soda, do you mean baking soda? Yes! I’m so sorry that wasn’t clear in the listing. I’ve updated to make that correction. Thank you for letting me know! cocoa = cocoa powder? Thanks! and what recipe did you use for the frosting? its so nice and white! I used my vanilla buttercream frosting on this cake. 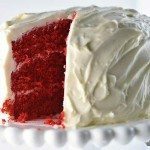 Would this cake recipe do well for cake pops?i I recently made cake pops from a red velvet cake recipe but the cake oozed oils, cracking the candy coating. I’d really like to make blue velvet cake pops for an upcoming baby shower. Thanks! I’ve not made cake pops with this recipe so I can’t answer from personal experience. So sorry I’m not more help! Did you use the heritage frosting or cream cheese frosting? And which of this frosting has thicker structure? You can use which ever frosting you wish – I used Cream Cheese Frosting in this picture. The two frosting have completely different consistencies. Hope this helps – enjoy the cake. Thanks! I tried this recipe today, but the layers came out pretty flat 🙁 I used 8 inch cake pans, but they are nowhere as fluffy as in the picture. But the taste is very good. Do you think I did something wrong, or will it work if I double or triple the recipe? I want a somewhat large cake for a babyshower. I’m sorry it turned out flat for you. I’ve not had that happen and can’t be certain what caused it. Sometimes if leavening ingredients aren’t really fresh that can happen. I always bake the cake according to this recipe and haven’t yet baked a larger one, so I can’t say what the cooking times would be for another size other than my recipe. I wouldn’t suggest doubling quantity and using the same size pans (I’m not sure if that is what you are asking). Maybe double check the freshness of all of your ingredients to see if that helps. Thanks Helena. Hi can i use regular food coloring or does it have to be gel? I made the recipe but it didn’t rise much at all.. Is that to be expected? 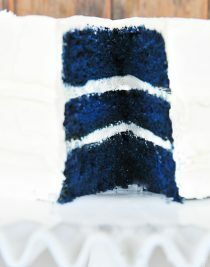 Hi, can these blue velvet used for stacked wedding cake?. I’ve never stacked more layers than shown in the recipe, Banu, so I can’t speak to the results. Thanks! 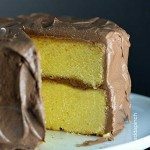 Hi, i came upon this recipe for the blue velvet cake. I hve just tried it, but the color came out more green. I have used the blue powder for the color. What did i do wrong and how many of the powder should. i use to get the blue. I’ve not made this with blue powder before Alda, so I can’t say how it turns out with it. Thanks! The minute I saw this recipe on Pinterest, I immediately wanted to try it! I read the instructions carefully (probably about three times) prior to making the cake. I even measured and had things waiting so all I had to to do was add them when it was their turn. Unfortunately, my cake turned out more brown than anything else. I even tried adding a bit more of the blue dye to even it out, but it still came out brown. What did I do wrong? Would it have made more sense to add a little less cocoa powder in my case? It could be from using a different type of food coloring than I used, but not sure. In the recipe, I give the type I used. I also share a Note right under the recipe that I used Americolor Soft Gel Paste in Royal Blue and Violet. I would keep the cocoa the amount used in the recipe. Is the cocoa in this unsweetened? Yes, it is. Thanks Melanie!